A range of self-drilling plasterboard anchors which provide a strong and secure fixing point to plasterboard, without the need for pre-drilling or locating of studs. Available in zinc diecast and non-conductive nylon. 1. Place a Wall-Mate® on the end of a Phillips head screwdriver. 2. Put point of Wall-Mate® where the anchor is to be installed, and lightly pierce the plasterboard facepaper. Using firm pressure, screw Wall-Mate® into the plasterboard until head is tight against the facepaper. 3. 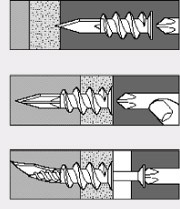 Choose a screw or hook suitable for the particular application. Attach the item to be fixed by driving the screw into the Wall-Mate®. 10kgs eg. bathroom & garage fixtures, mirrors & clocks. 10kgs eg. curtain rods, coat racks, paintings. plywood and composite office partitions where space is limited. Nylon Mini Wall-Mate 25 lbs. Zinc Mini Wall-Mate 30 lbs. These performance values are averages obtained under laboratory conditions. Note that these values will change depending on age, moisture content and surface treatment of the drywall (gypsum) material. Appropriate safety factors should be applied to these values for design purposes.